Some people claim that the Catholic Church added the “Apocryphal” – Deuterocanonical – Books into the Bible at the Council of Trent. One way of disproving that is to show them pictures of Bibles before the Protestant “Reformation” since those Bibles do have those books. 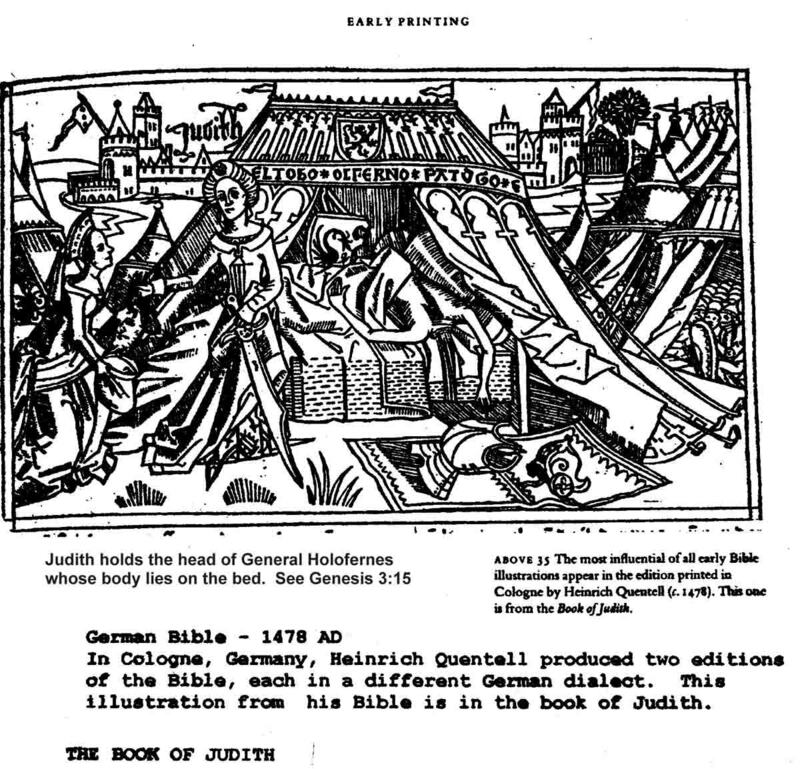 The book of Judith is one of those books. first published his New Testament in AD 1522 and his Old Testament translation in AD 1534. Below are Catholic Bibles in the German language before that. The earliest Germanic language version of the Bible was translated by Catholic Bishop Ulfilas (311-380 AD), also known as Wulfila. He was bishop, missionary, and Bible translator. He spent time inside the Roman Empire at the peak of the Arian controversy. In 348, to escape religious persecution by a Gothic chief he obtained permission from Constantius II to migrate with his flock of converts to what is now northern Bulgaria. There, Ulfilas translated the Bible from Greek into the Gothic language. For this he devised the Gothic alphabet. Fragments of his translation have survived, including the Codex Argenteus, pictured below. 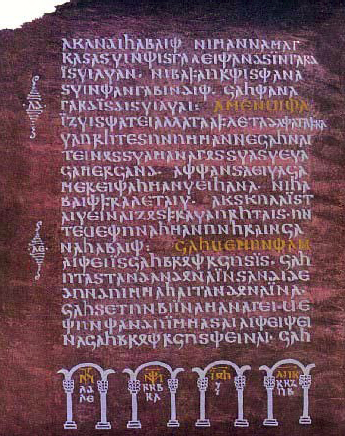 A parchment page of this Bible was found 1971 in the Speyer Cathedral. From Ulfilas’s translation came much of the Germanic Christian vocabulary that is still in use today. Charlemagne (Karl der Große) would foster the Frankish (Germanic) biblical translations in the 9th century. The scriptoriums of Charlemagne developed the writing standards that we take for granted today such as spaces between words, clear capitalized words, and easy to read script. These advancements were developed to speed the copying and the reading of Biblical manuscripts. Wenzel Bible (1389) contained the Old Testament in German. 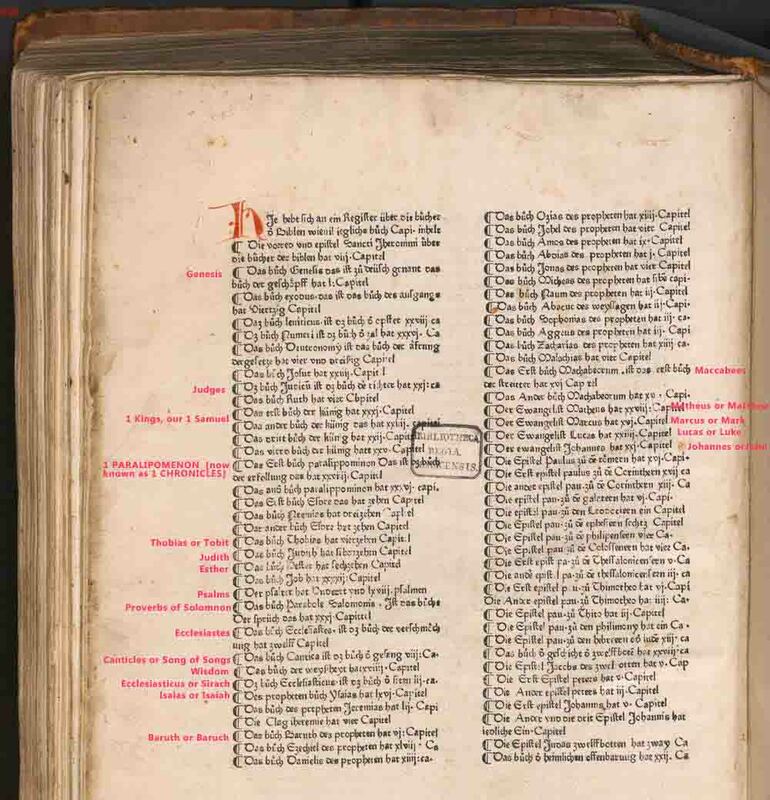 Johannes Gutenberg’s so-called 42-line Bible, printed in Mainz, was in Latin. About 40 copies exist today in various states of completeness. It was Gutenberg's invention of printing with movable type that made the Bible, in any language, vastly more influential and important. It was now possible to produce Bibles (and other books) in greater quantities at a lower cost. Before Martin Luther was even born, a Catholic German-language Bible was published in 1466, using Gutenberg’s invention. Known as the Mentel Bible, this Bibel was a literal translation of the Latin Vulgate. Printed in Strassburg, the Mentel Bible appeared in some 18 editions. For those of you who have not kept up on the changes of how the spelling and the script has changed from 15th century German till today’s modern English I have provided the image below. Just remember that the old “s” looked more like an “f” back then. Also consider that the letters “y” and “j” are latter additions to the alphabet, so think of these letters as somewhat interchangeable. You can notice the similarity of script in the small case for the “y” and the “i” and the “j.” And notice that the latter two have dots above. This list should also be of some help.